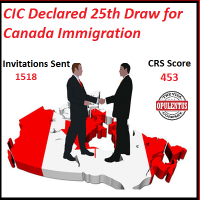 The Canada Express Entry scheme 25th draw and second in this year held on January 13, 2016. This draw has displayed the significant decrease of CRS points compared to the previous draw. Totally 1518 candidates who scored 453 points or above invited for applying permanent residency. This 25th draw of Canada Express Entry Scheme has seen the decrease of eight points compared to the previous 24th draw that took place in this month. So far this 25th draw is considered to be the second lowest among all the draws. The lowest score is 450 in the 18th draw held in the month of October. The recent draw is the seventh Express entry draw after the election of new Government in Canada. These draws have a significant number of people without job offers in Canada. Since October 19, 2015, there is step by step decrease of points, as analysts said. In the last seven draws, the points dropped from 489 to 453. Immigration, Refugees and Citizenship Canada have informed that in the year 2016, there would be successive draws to attract a number of skilled migrants. The CRS points likely to decrease in the upcoming Canada Express Entry draws.